Zoom around town with the LEGO DUPLO Creative Cars set featuring over 40 colourful, vehicle-themed DUPLO bricks to build and rebuild the coolest cars. 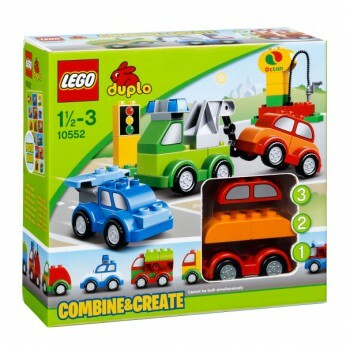 With the special Combine and Create concept, your child can create vehicles of all shapes and sizes by combining just a few colourful bricks. This great set includes 3 wagon bases, decorated window, traffic and gas station logo bricks, a hose, engine, crane, truck body, spoiler elements and other assorted bricks. A colourful building inspiration poster is also included. This toy costs approximately £14.99 (for the latest and best prices make sure you check our retailer list for the LEGO Duplo Creative Cars 10552 above). In our review of LEGO Duplo Creative Cars 10552 we classed it as being suitable for ages 6 years, 7 years, 8 years, 9 years, over 10 years but recommend you check the manufacturer specific advice before purchasing.